The bugle is a brass instruments in simple form, having no valves , pitch-altering devices. All pitch control is done by varying the player's use of his lips & tongue , since the bugle has no other mechanism for controlling pitch. Consequently, the bugle is limited to notes within the harmonic series. It has been used for years by members of our Armed Forces, the Boy Scouts of America and VFW units around the world. It is made of the finest quality brass by highly experienced, skilled craftsmen. 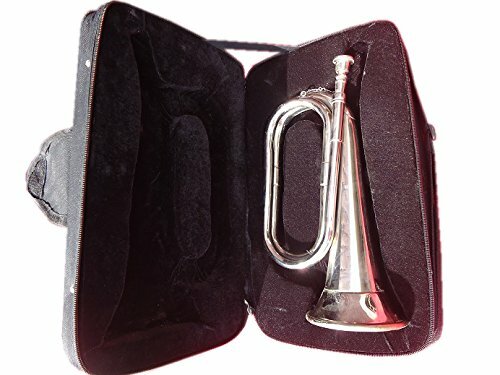 The bugle is used mainly in the military where the bugle call is used to indicate the daily routines of army camp & to assemble the leaders to give orders to the camp.Most army bugle calls, even though they sound different from each other, are based on only 4 different notes: F, A-sharp, D and a upper F.Its length is 10.5"with bell diameter of 4".